Yes, so straight after the pesky finals, I hightailed it into London straight after to watch Shawn Mendes with my best friend. 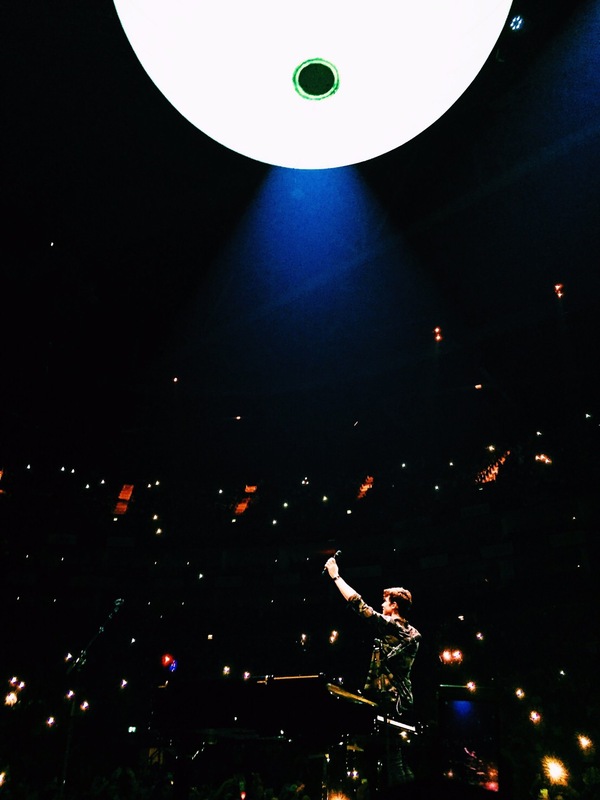 It was such a beautiful day, but incredibly hot for London weather (we speculated it was because Mendes was there). Shawn talked about his mum and aunt being there that night, and said, “I want you all to make some noise, to show that family is where it’s loudest at. Can you do that?” It’s funny how musicians mention their families at their shows, because isn’t family the symphony of your life? His melismas. His vibrato. There’s something about Shawn’s voice that is segmented – each note he sings has its own boundary; a scenic, rustic, white picket fence freshly lacquered. And then there’s the vibrato, incredibly rhythmic and reliable like the ocean waves, a very well-defined pattern of lull and peaks. Almost like the familiar stairs at home. I really, really like it. It just seems to imply he’s this sturdy rock you can rely on. He’s improved vastly from the boy on Vine, and it’s odd knowing I’ve heard him grow. He looks tired. 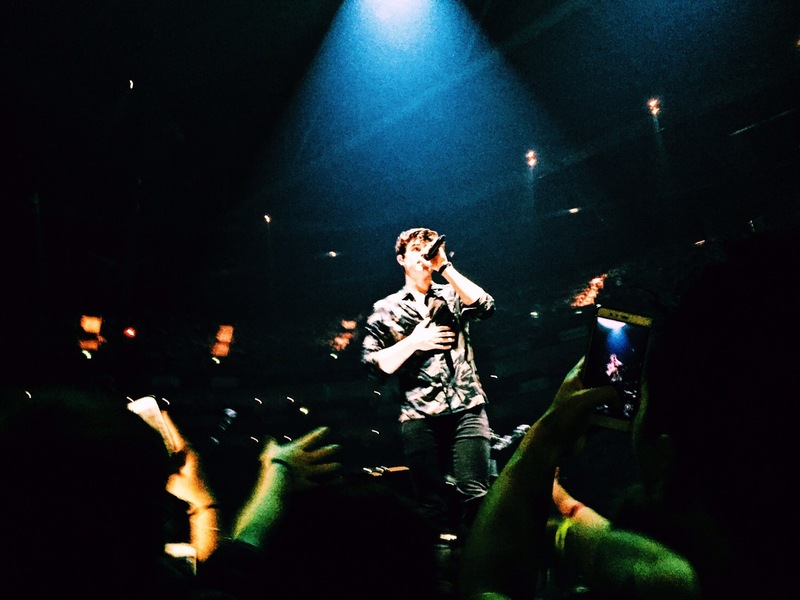 I gazed at his broken watch moving erratically as his slender fingers played the chords to “Castle On The Hill”, and I tried to imagine the boys on my course doing what Shawn does as a living – could they pull it off? Could they handle the pressure? Maybe initially, but in the long-term, I don’t think so. I don’t think anybody can with ease. It’s a matter of resilience. Being a singer is also being an entertainer and a performer. So when I saw his glassy eyes, passing like a ghost over the ecstatically wild crowd, it hit me that this was his job. He is meant to deliver and meant to perform; I suddenly felt a little afraid. Singers use that tactic of pulling away from the microphone to let the audience sing the high bits – I saw that excessively with Calum Hood from 5SOS when they performed in Bangkok (mind you, I haven’t watched too many concerts, but that was extremely prominent and obvious). Perplexingly enough, Shawn pulls away during catch phrases of his songs, which were all varied in pitch, and there was definitely no pattern in always letting the crowd sing high parts. Because, this is Mendes everybody! He can hit the high notes like a bullseye. 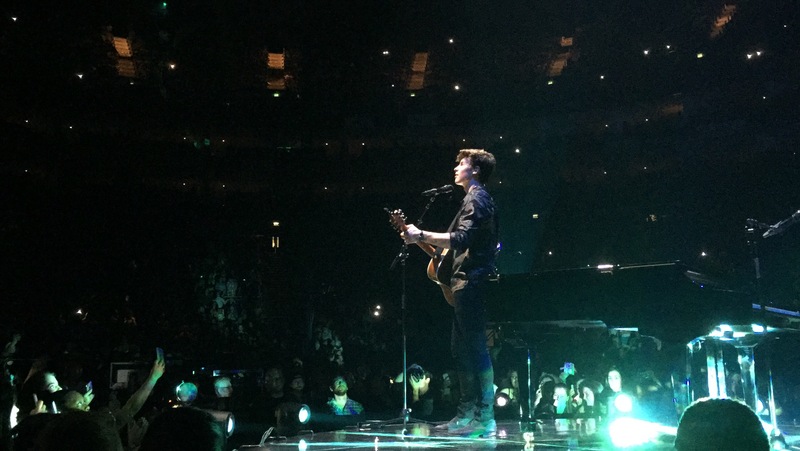 During “Never Be Alone”, I found it hilarious when Shawn asked the crowd to sing the iconic “Woah-oh-ohhhh-ohhh-oh-ohh-oh-oh-oh” part (sorry I wanted to make it realistic) because he attempted to do heavenly melismas/riffs over the top of it, but when he did, the crowd probably thought they had to sing what he was doing and most of the crowd simply trailed off thinking they weren’t supposed to sing. 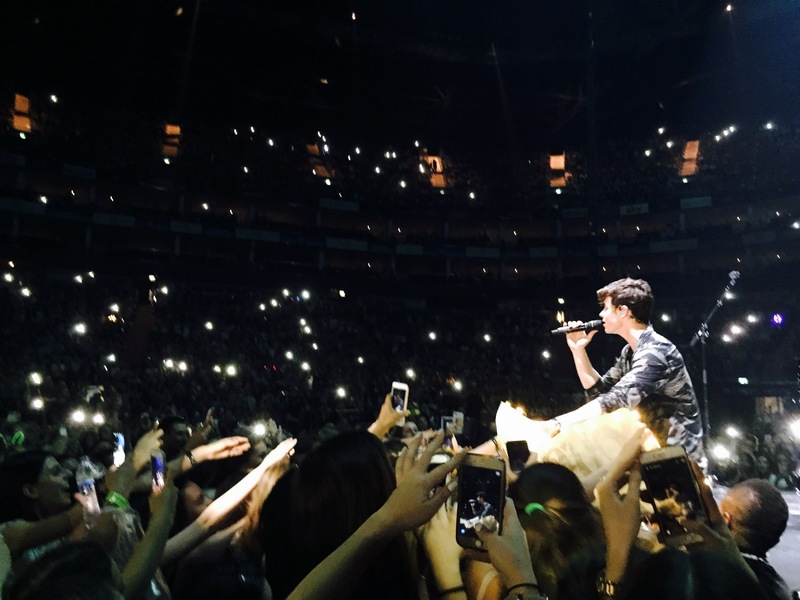 So Shawn kept going, “Come on London, sing it real loud now! Woah-oh-ohhh….” and then would try to quickly switch to those riffs, but the crowd didn’t really get it and once again got a bit derailed. Soon after many “Alright sing with me!” ‘s and “Come on, scream it! Woah-oh-ohhh…” ‘s, he did pull off some very great melismas with the backing track of the finally cooperative crowd, and it sounds great on film. I just found it funny hearing the hesitation and confusion of the crowd initially. Just me? Okay. My favourite performance was “Ruin” – my friend begged to differ because the interactive portion apparently was extended too long but that was exactly what I adored. It was spacious, it was tranquil, it was bucolic. Very John Mayer. In Shawn’s words, the song was timeless. I cannot say enough how beautiful it was – “Do I ever cross your mind?” was on repeat, and it basically embodied every unrequited lover’s mantra (too real). His piano-playing was…pretty good for somebody who learned it in 8 months (correct me if I’m wrong). Of course sweat makes your fingers slip and you’re performing in front of 40,000 people, so I can’t blame him for little mistakes I heard. It made me admire him even more (if that’s even possible), because it reminded me he’s just an ordinary guy with an extraordinary life. Alrighty, I could go on, but it would then require full-blown Vancouver referencing. 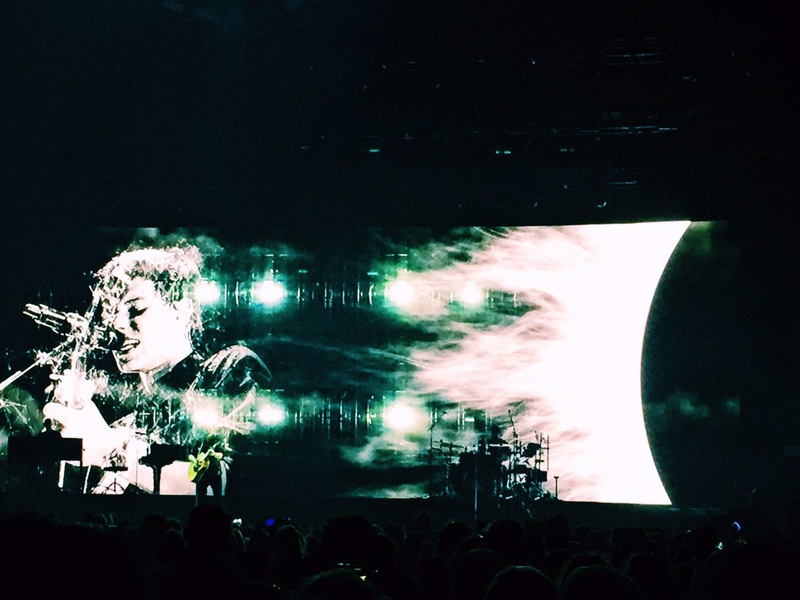 Overall, it was so devastatingly amazing and it is easy to say the concert topped One Direction & 5SOS (if we’re comparing pop artists here) – go, and experience the incredible talent of Shawn Mendes. Pingback: An Arena, Historical Landmark & Apartment Block – THAT MED KID. Pingback: There’s Nothing Holdin’ Me Back | Shawn Mendes (Cover) – THAT MED KID.